Recovering the planet's natural resources is hard. It's difficult, dangerous, and can be environmentally damaging. Cue an IT revolution, with smart communications, 'extreme Wi-Fi' covering vast deserts, autonomous vehicles that extract vital rocks and minerals, and geofenced employees who receive warnings if they get close to a mine's famously colossal big machinery. There's even a 'smart bolt' that creates an underground support structure which is classic Internet of Things. The final goal is the autonomous mine, where humans are completely removed from the mining process. As with most industries, using the term 'smart' means increasing efficiency, though in mining there's a vital added ingredient: human safety. "It's about doing it smarter to reduce cost, lower emissions and increase productivity, while ensuring safety is paramount," says Greg Smith, General Manager, Mining Support Group, Global Mining, Hitachi Construction Machinery. 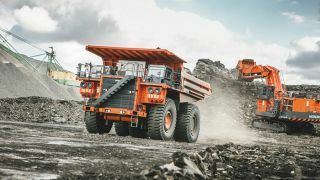 Cue Hitachi's 'Smart Excavator' project, which uses connectivity, big data analytics and more to work out everything from the optimal dig pattern at the coalface to the exact routing of vehicles (and soon, autonomous vehicles) to maximise energy efficiency. Mining is where big industry, big data and big money collide. Perhaps the most ingenious device so far for smart mines is the Smart Rockbolt that instantly creates an underground Internet of Things. Bolts are an everyday tool in mines; they're used to prop up ceilings and walls during dynamiting. In a very literal sense, they hold the whole operation together. However, they're also the main weak link, being easily damaged, meaning they can lose their load bearing capability and become liable to give way without warning, causing deadly collapsed tunnels and cavities. Cue the Smart Rockbolt from EISLAB (Embedded Internet Systems Lab) at Sweden's Lulea University of Technology (LTU), which has sensors to measure both vibrations and strain, and which can run for years on a single non-rechargeable battery cell. Link it via 4G or Wi-Fi to create a mesh network and a 24/7 safety monitoring system is born. This is potentially big, big business: the global mining industry uses 100,000,000 bolts every year. Keeping workers away from dangerous equipment is important in all large-scale manufacturing plants, but in mines it's imperative. Intel has been working on geofencing technology that integrates with a Bosch microclimate monitoring system, the sensors of which measure humidity, sound, temperature and gas levels. Any problems, and staff in the area get a text sent to their phone. "We can geofence around equipment so the miner can get a warning on their phone not to enter an area because there's heavy machinery working, or because the air quality is not good," says Ophir Shabtay, Location Core DM, iCDG/WCS/CNV at Intel in Israel, who says that the same technology can be used for accurate indoor positioning. "A worker can also send an alert to the control centre asking for assistance." It's also possible for the control centre to get real-time feedback from wearable devices on workers, such as blood pressure and heart rate.